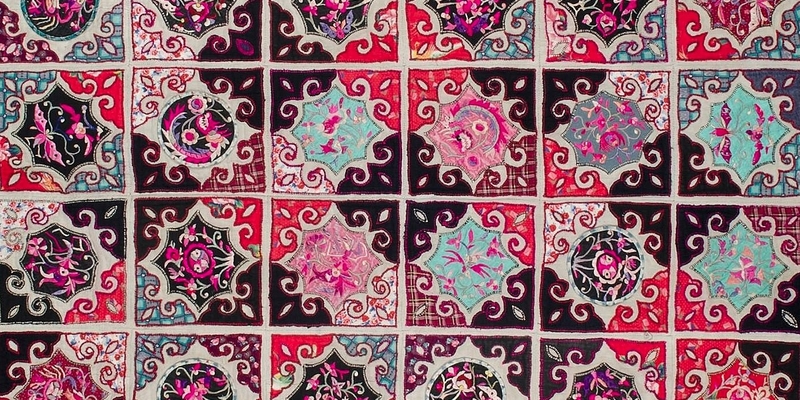 In southwest China, traditional bed coverings, clothing, and household items have long been made from patched and appliqued scraps to create artistic and functional textiles. A bi-national consortium of American and Chinese museums has worked together to document and research these quilts, an art form little known outside certain ethnic minority communities. Although the making and using of these quilts have declined, a surge of renewed interest among scholars, artists, and locals is leading to growing efforts to study the textiles and the skills needed to continue making them. Download coloring pages from this exhibition. This exhibit is sponsored by The Henry Luce Foundation. Additional support comes from the International Folk Art Foundation; the Museum of New Mexico Foundation and donors to the Exhibitions Development Fund; and the E. Rhodes and Leona B. Carpenter Foundation. Project partners include Yunnan Nationalities Museum (Kunming, Yunnan, China); Anthropology Museum of Guangxi (Nanning, Guangxi, China); Guizhou Nationalities Museum (Guiyang, Guizhou, China); Michigan State University Museum (East Lansing, Michigan, USA); Mathers Museum of World Cultures, Indiana University (Bloomington, Indiana, USA); the International Quilt Study Center and Museum, University of Nebraska-Lincoln (Lincoln, Nebraska, USA); the American Folklore Society; and the Chinese Folklore Society.